John R. Fultz lives in the North Bay Area, California, but he’s originally from Kentucky. His short fiction has appeared in several magazines and anthologies. He hase written comics for Boom Studios’ ZOMBIE TALES and CTHULHU TALES. His graphic novel of epic fantasy PRIMORDIA (illustrated by the great Roel Wielinga) was published by Archaia Comics in an “ultimate hardcover edition” in 2012. CLICK HERE FOR MORE BY JOHN R. FULTZ. The Books of the Shaper — (2012-2013) Publisher: It is an Age of Legends. Under the watchful eye of the Giants, the kingdoms of Men rose to power. Now, the Giant-King has slain the last of the Serpents and ushered in an era of untold peace and prosperity. Where a fire-blackened desert once stood, golden cities flourish in verdant fields. It is an Age of Heroes. 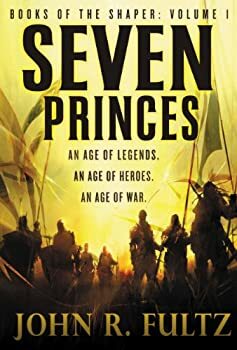 But the realms of Man face a new threat — an ancient sorcerer slaughters the rightful King of Yaskatha before the unbelieving eyes of his son, young Prince D’zan. With the Giant-King lost to a mysterious doom, it seems that no one has the power to stop the coming storm. It is an Age of War. The fugitive Prince seeks allies across the realms of Men and Giants to liberate his father’s stolen kingdom. Six foreign Princes are tied to his fate. Only one thing is certain: War is coming. SEVEN PRINCES. Some will seek glory. Some will seek vengeance. All will be legends. Trimesqua, King of Yaskatha, is murdered by Emhathyn, an ancient wizard who raises the dead to kill everyone in the palace. The young Prince D’zan manages to escape, helped by his faithful bodyguard Olthacus the Stone, and sets out on a quest for vengeance. To retake Yaskatha, he seeks the help of other rulers, including the two princes of Uurz: the strong warrior Vireon and the scholar/writer Lyrilan.